Americas first railroad and now a part of the CSX Railroad family. 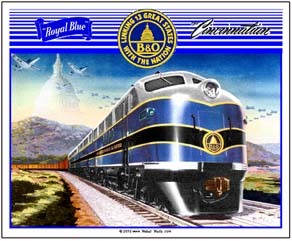 The B&O is a history of America, through the Civil War, the Great Depression, WWI and WWII, she was a fighter all the way. Individual marks are licensed marks owned by CSX Railroad Company and are used under an active license agreement. 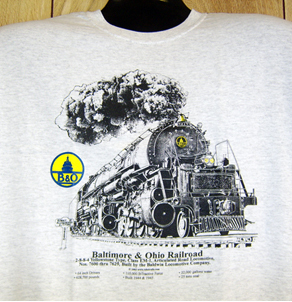 Baltimore and Ohio Railroads famed EM-1 articulated steam locomotives were some of Americas largest and most powerful steam locomotives. This image is at the summit of the Allegheny Mountains according to sign just beside the locomotive. Tin sign featuring the Baltimore & Ohio Railroads FT freight diesel locomotives as presented by the EMC Division of GM. B&O was on a war footing as World War II P51 Mustang planes fly overhead and the Nations Capital Dome is looming in the background. Coffee mug featuring the Baltimore & Ohio Railroads beautiful EA and EB streamlined diesel locomotives. These beauties were the first such units produced by the EMC Division of GM. Baltimore & Ohio's famous and powerful Yellowstone Type, Class EM-1 2-8-8-4 articulated steam road locomotive coming right through this mug at the summit of the Alleghnies 2,628ft. Built by Baldwin Locomotive Co. in 1944 and 1945. 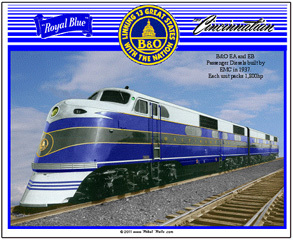 Coffee Mug featuring B&O logo superimposed over the paint scheme of its diesel locomotive. A very unique way to present the railroads logo. 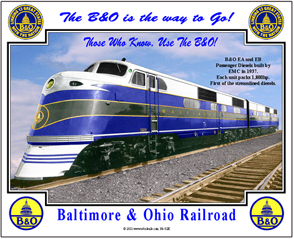 Classic Baltimore & Ohio Logo decorates this License Plate with a new EMD FT Diesel locomotive. 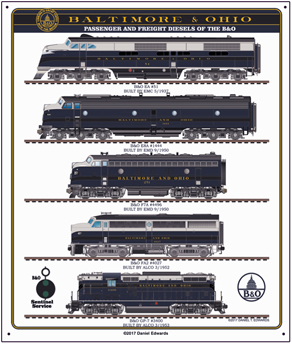 Mouse pad features the classic Baltimore and Ohio EA and EB diesels built by EMC in 1937 specifically for the B&O. Each unit had 1,800hp and they pulled B&Os flagship passenger trains. Numbers 51 through 56 were of this series. Mouse pad features classic Baltimore and Ohio FT diesels with a World War II backdrop of fighter planes. Your mouse will feel safe on this pad! 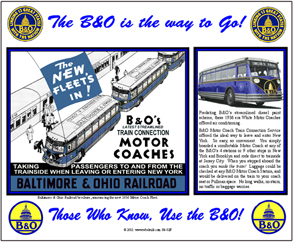 Tin sign featuring circa 1936 image and advertisement of the Baltimore & Ohio Railroads Motor Coach Service in New York City and Brooklyn. The paint scheme on these buses predated the livery used on the B&Os streamlined diesels. Another Daniel Edwards masterpiece. Baltimore & Ohio Railroad diesels are presented on this metal sign in beautiful Blue, Black and Grey with yellow/gold trim. From the 1st passenger diesel to the workhorse Geep. 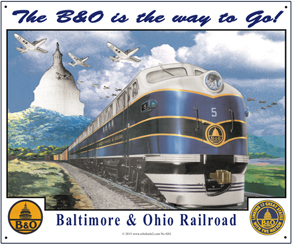 Tin sign featuring Baltimore & Ohio Railroad EA-1 and EB-1 streamlined passenger diesel locomotives, the very first offered by the EMC Division of GM. These diesels set the standard for all future passenger diesels. 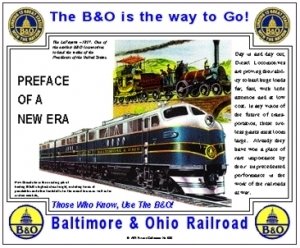 Sign features a new set of Baltimore & Ohio FT diesels with image of one of the B&Os first steam locomotives, along with verbage and logos. 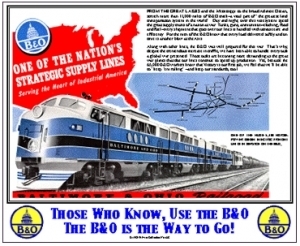 The B&O is the way to go! Tin sign featuring historic logos of the Baltimore & Ohio Railroad, our Nations first railroad chartered in 1827. Brought us through several wars, including the Civil War, when Confederate General Stonewall Jackson played havoc with the road. 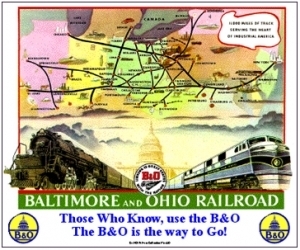 World War II ad promoting the Baltimore & Ohio Railroads supply line of rails, with a system map, verbage and logos. A very unique and historic sign of Americas greatest era when railroads were on a war footing. A familiar sign found in just about all railroad stations in times gone by. Very nostalgic and comical if used in the right setting. 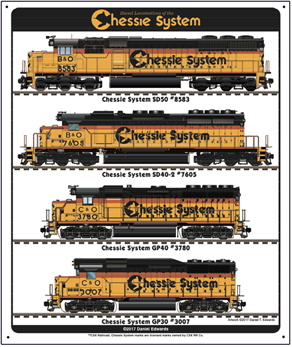 Great gift idea for the railfan who thinks he has everything! Tin sign featuring circa 1940s system map of the Baltimore & Ohio Railroad with an E-unit diesel and EM-1 steam locomotive, verbage and logos.